April 23, 2006. The Consumer Project on Technology’s Comments on the Commission’s Questionnaire on The Patent System In Europe. European Community Page on the Community Patent. March 3, 2003. Excerpt from Report on the 2490th Council Meeting. COMPETITIVENESS - Internal Market, Industry and Research. May 26, 2003. European Community press release. Access to medicines: EU clears plan to ensure delivery of cheap medicines to developing countries. June 6, 2003. Deutsche Welle. EU Presents Medicine Initiative to G8. May 27, 2003. Bloomberg News. EU bars reimport of drugs headed for poor countries. June 23, 2004. Speech by Pascal Lamy, International Conference on the 10th Anniversary of the WTO TRIPs Agreement. The TRIPs agreement 10 years on. In establishing an internal market, measures for the introduction of European instruments to provide uniform intellectual-property rights protection throughout the Union and for the setting up of centralised Union-wide authorisation, coordination and supervision arrangements shall be established in European laws or framework laws. A European law of the Council of Ministers shall establish language arrangements for the European instruments. The Council of Ministers shall act unanimously after consulting the European Parliament. June 5, 2002. EU Statement. Access to medicines: the true story, the state of negotiations. June 5, 2002. EU Press Release. Access to medicines: Brundtland and Lamy push ahead. May 21, 2002. EU Dossier. Generic Medicines. January 25, 2002. G-10 Medicines High Level Group on Innovation and Provision of Medicines. High Level Group Set to Improve Equality of Access to New Medicines Across EU. December 1, 2001. EU Press release. World AIDS Day: Lamy calls for more action on access to medicines after progress in Doha. November 6, 2001. Directive 2001/83/EC of the European Parliament and of the Council. On the Community Code Relating to Medicinal Products for Human Use. October 15, 2001. G-10 Medicines High Level Group on Innovation and Provision of Medicines. Consultation Paper. Director Generals's Page on Trade and Development and Access to Essential Medicines. March 15, 2001. EU Resolution on access to drugs for HIV/AIDS victims in the Third World. 1999, December 6-8, EU Aide Memoire detailing its objections to the Dominican Republic's proposed industrial property legislation (English translation). 1998, July 6. Directive 98/44/EC of the European Parliament and of the Council on the legal protection of biotechnological inventions. This document creates obligations for mandatory compulsory licensing of patents in a specified "field of exploitation." March 27, 2003. MSF press release. The price of essential medicines in developing countries: The member states of the European Union must strengthen the European price regulation scheme. May 27, 2002. ACT-UP Paris press release. Access to Treatment in Poor countries: The True Face of Pascal Lamy. March 20, 2002. European Commissioner for Trade Pascal Lamy. Letter to the Trans Atlantic Consumer Dialogue concerning implementation of the Doha Declaration on the TRIPS Agreement and Public Health. Page one, Page two. March 5, 2002. ACT-UP Paris press release. The European Commission Reneges on Commitments Made at Doha. February 15, 2002. Trans Atlantic Consumer Dialogue. 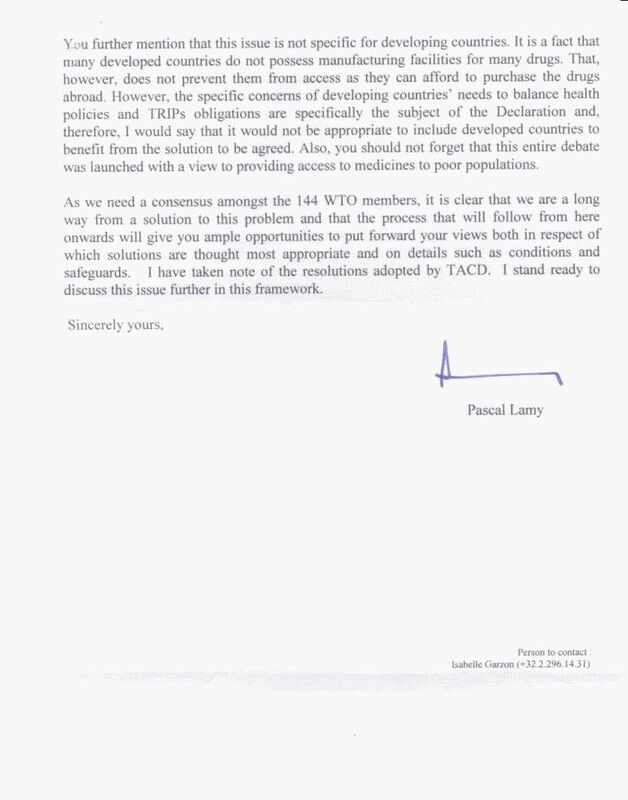 Letter to European Commissioner for Trade Pascal Lamy and US Trade Representative Robert Zoellick on the Doha Declaration. 2001, March 20. Address by Jim Murray, Director of the European Consumers Organisation, to the conference to mark the third annual European Consumers Day. 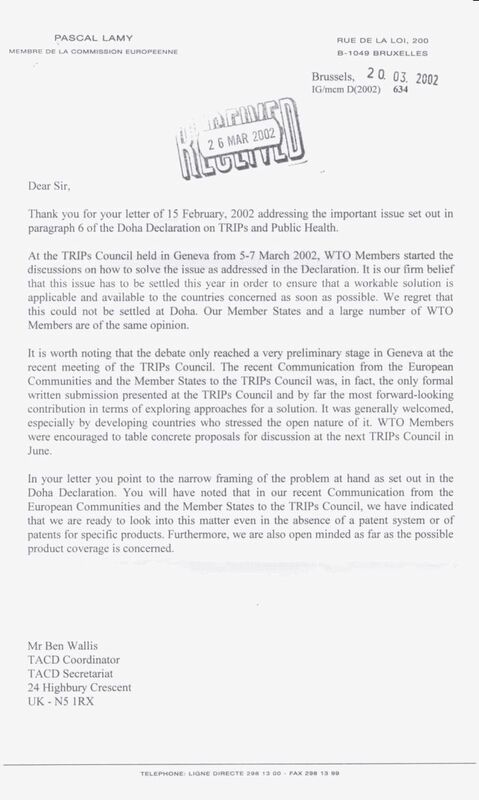 2000, November 6, James Love: Notes on EU "Issue Group: Health" meeting (organized by DG Trade). 2000, September 27, letter by six public health groups to EU Commissioners Lamy and Nielson on access to medicines. November 15, 2005. Elisabeth Rosenthal for the International Herald Tribune. EU splinters when buying drugs. March 27, 2003. UN Integrated Regional Information Networks. Medicines Sans Frontieres Concerned About Attempts to Weaken Proposals for Cheap Drugs. 2001. April 23, Reuters. EU says knowledge piracy threatens "new economies."